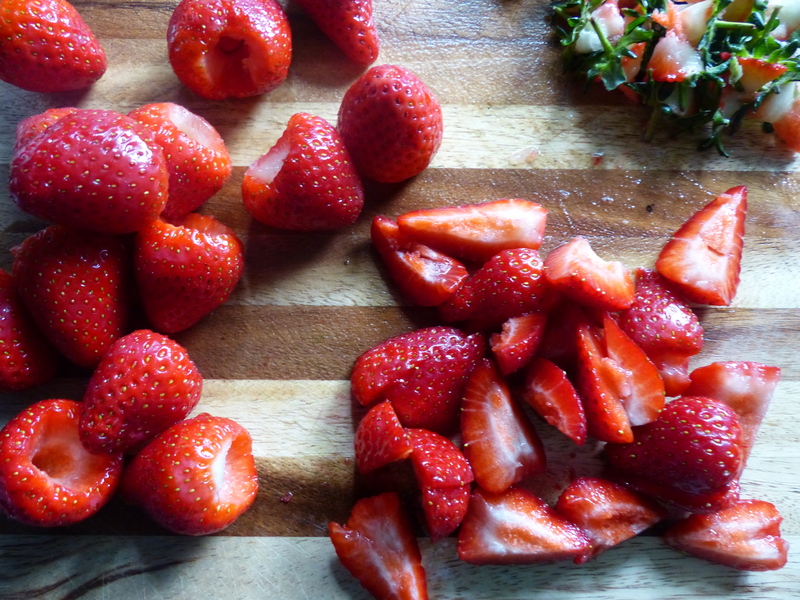 Strawberries in July: get ’em when they’re sweet, plentiful and cheap. Though I’d love to be picking them in the fields on a warm, sunny day, alas I’m not that lucky (downside of living in London and not having a car). Nevertheless, I’ve been buying them en mass and eating them every which way – plain, on my cereal, in smoothies, with cream poured over and now in ice cream. 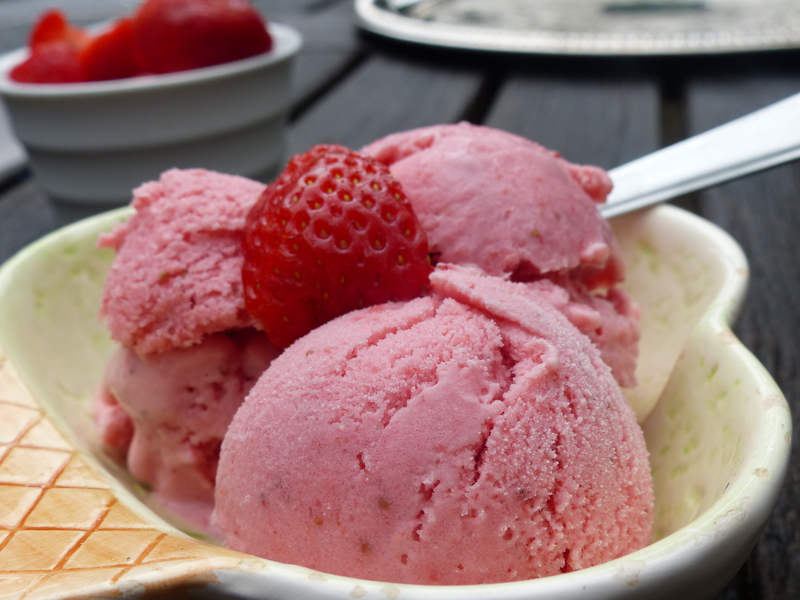 Inspired by my recent Watermelon Slushie post, I wanted to freeze strawberries and transform them into a simple ice cream. Simple, easy and quick. I didn’t want to depend on an ice cream maker nor cooking over a hot stove. 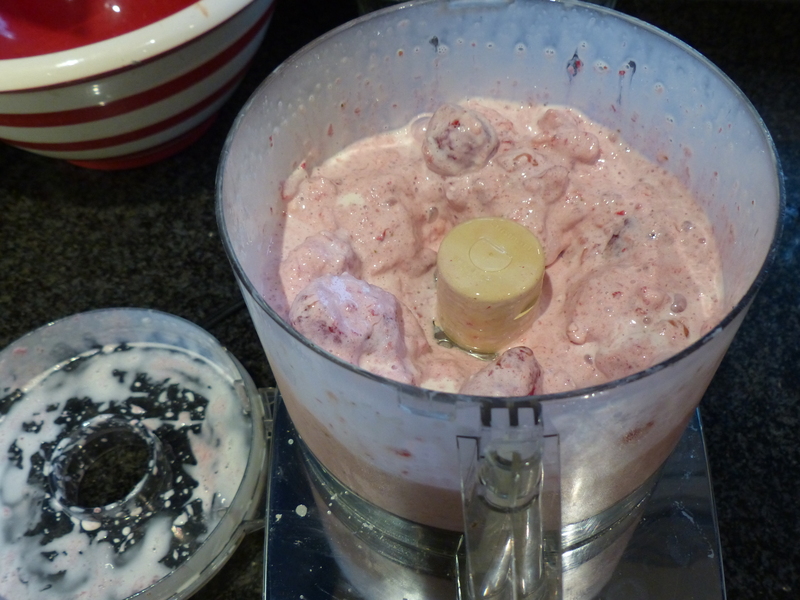 After a bit of recipe R&D on the world wide web, I found a bunch of ice cream recipes using a food processor. Just frozen berries, a bit of liquid, sweetener and other flavor add-ins, if desired. Now I’ll admit, this is not the same product you’ll get with an ice cream maker. It’s a bit icier and less creamy. 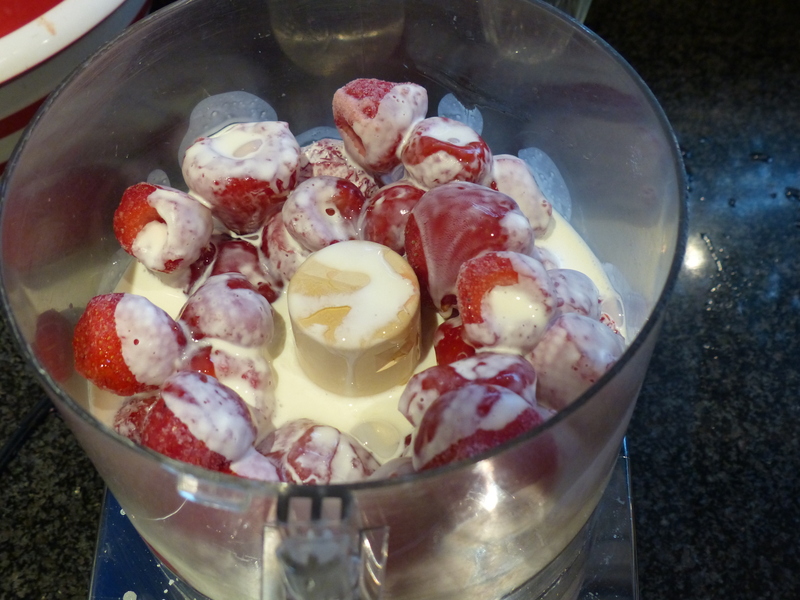 It uses half-and-half (single cream, here in the UK) rather than whipping cream (double cream), so it’s less rich……..which I prefer as sometimes full-fat ice cream coats my teeth and then major guilt sets in about my gluttonous fat intake. This also isn’t the same product you’ll find at the store. No it’s not. 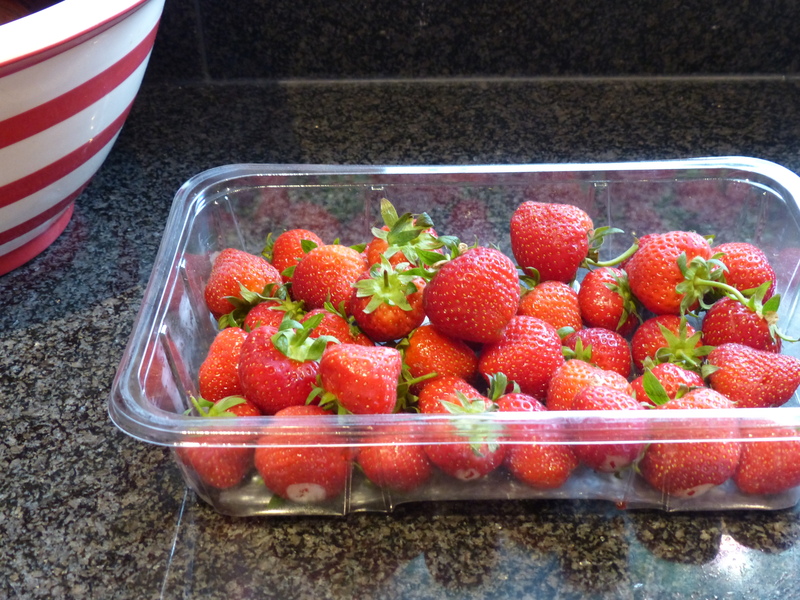 It’s fresher, less airy, has real strawberry bits, and no artificial pink coloring. 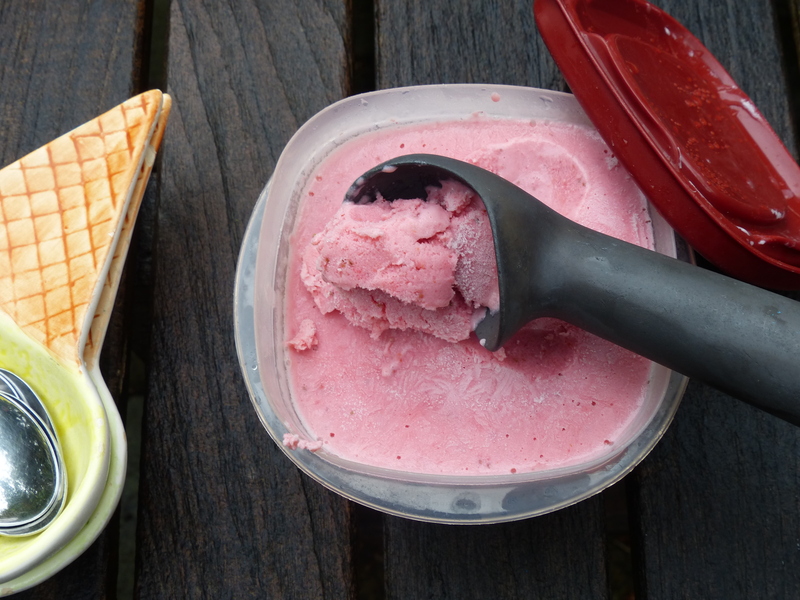 So celebrate summer’s bumper crop of strawberries and sink your spoon into some cold and creamy homemade strawberry ice cream. Drizzle of dark chocolate optional. Note: Serve drizzled with dark chocolate sauce for a more decadent dessert. 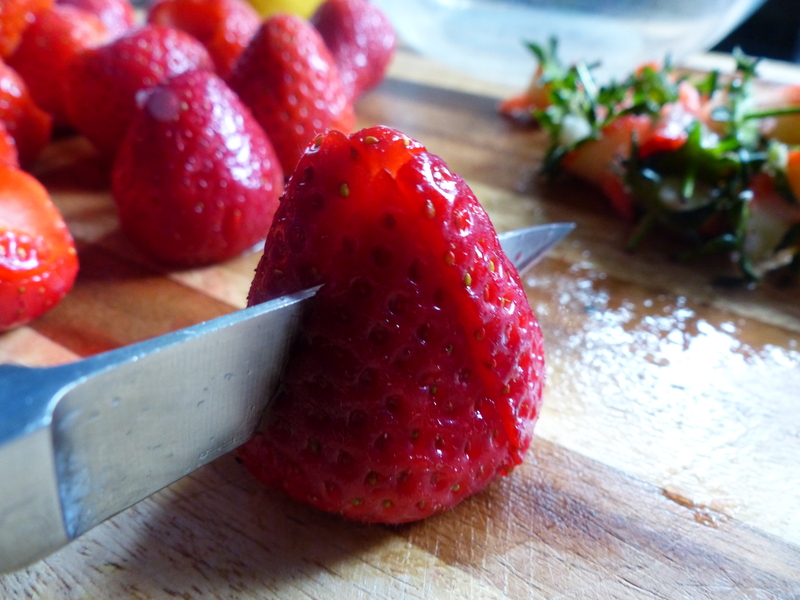 Using a small paring knife, hull the strawberries. That is, remove the stem and hard white core. (Alternately, you can hull with a straw – place the straw on the stem and gently push out the stem and core). 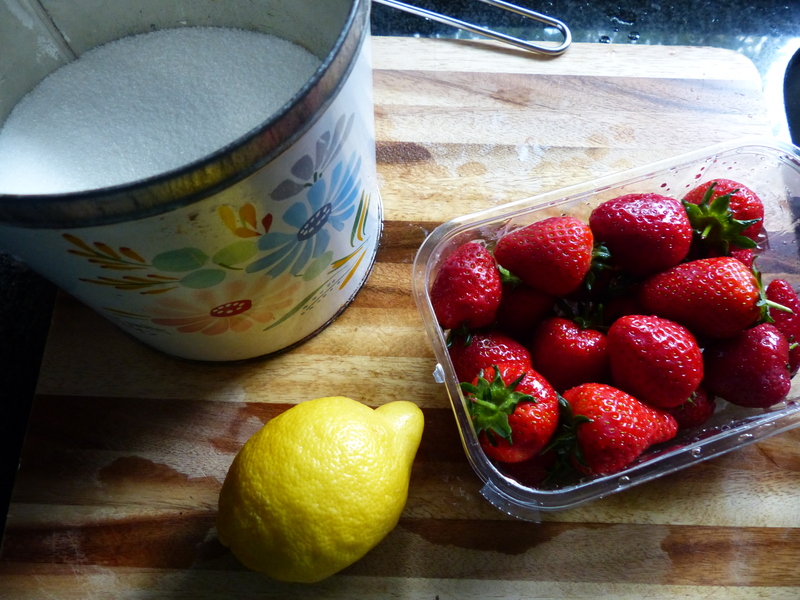 Place strawberries in a zipper freezer bag. 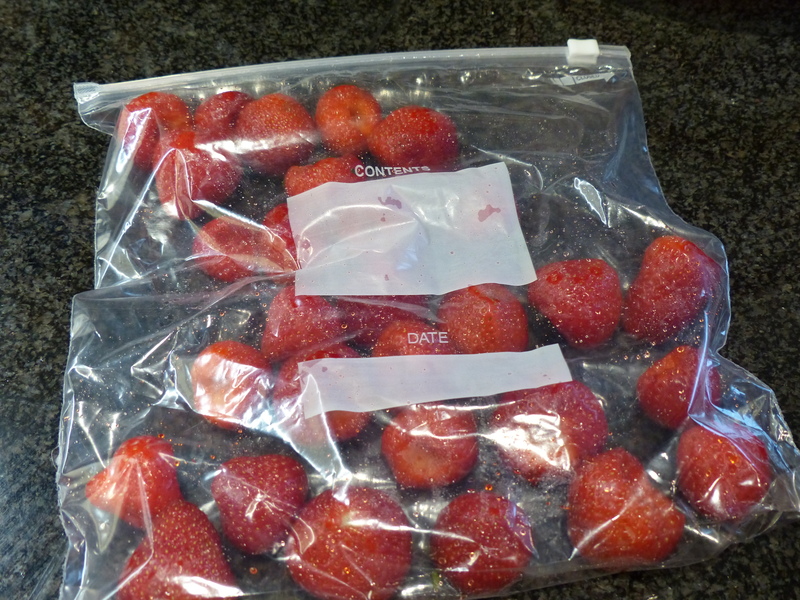 Lay bag flat in freezer, trying to get strawberries into a single layer, and leave overnight or 4 hours minimum, in order to ensure fully frozen. 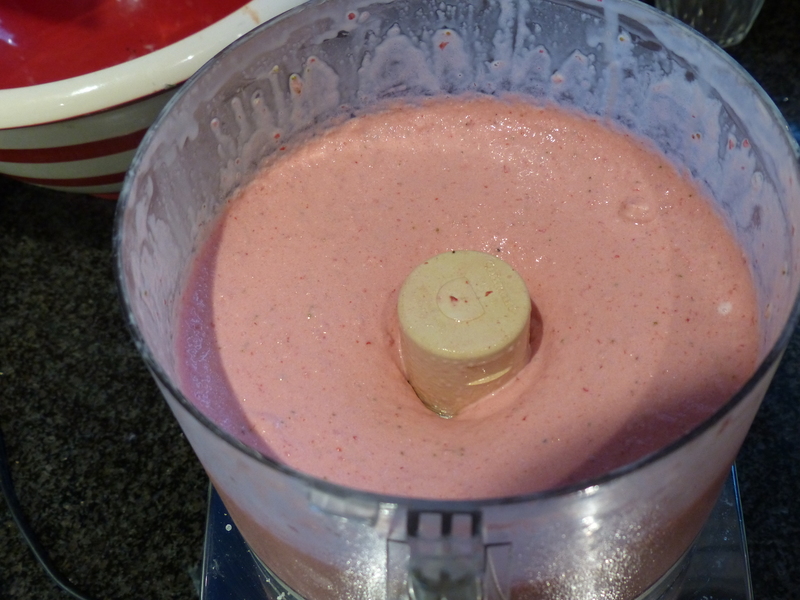 Place frozen strawberries, half-and-half and honey in a food processor. Pulse on-and-off, wiping down sides of food processor between pulses, until smooth, about 2-5 minutes. This may take a bit of time depending on the power of your processor. Taste and add additional honey, if necessary. Your ice cream will be about the consistency of soft-serve. 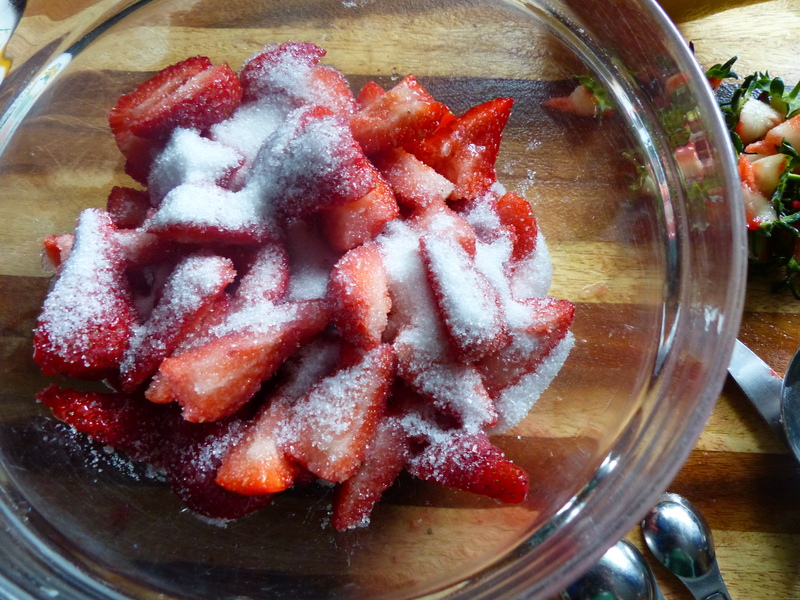 If you would like it firmer, transfer to an airtight container and freeze for 30 minutes or up to one week. 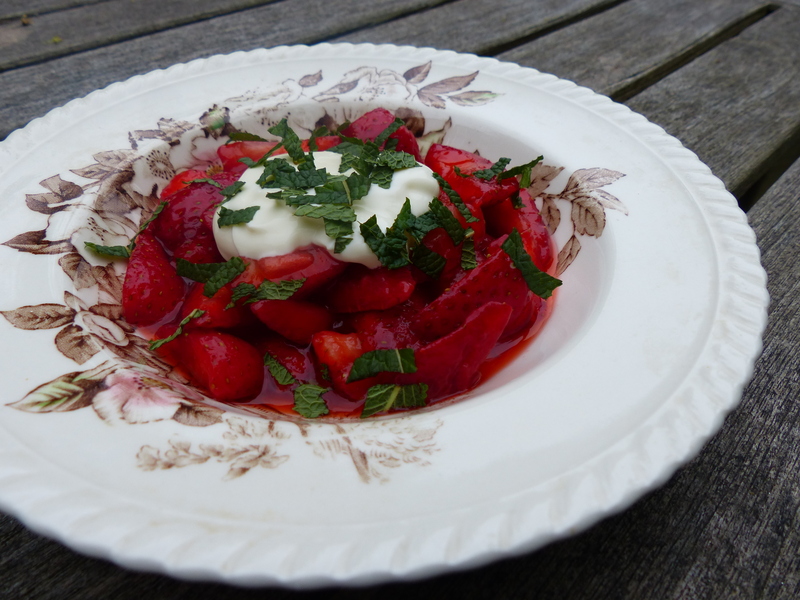 Let sit at room temperature for about 5-10 minutes to let soften before serving. Using an ice cream scoop, divide between four bowls and serve.